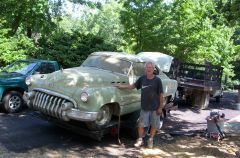 I saw a fastback '50 Buick Special model 43, on craigslist for sale for $2000 in PA. I wish I had saved that guys number, because that was a cool car. I just didn't have the wherewithal at the time to buy it. And so far my search has turned up nothing. I've been looking all summer for a 1950 fastback, either a 2 or 4 door. For some reason, they're proving to be pretty elusive near me in Upstate/Central NY. I'm finally in a position now where getting a car is not out of the question. Maybe this is better off in the Buy/Sell category, but I was curious if anybody has a 2 or 4 door fastback in or near Binghamton, NY that they'd let go for around 3 grand. It doesn't have to be perfect, it just has to run and not have too much cancerous rust. Of course I don't discriminate. If there's a 50 Buick coupe or sedan, I'd be interested in that as well. Sorry if this is in the wrong place, I'm just trying to get a feel as to what's out there. Maybe my next step should be contacting a local Buick club. Waiting is hard...especially when there's been cars near me that I could snap up, but unfortunately I didn't have anybody to go look at them with me, and I didn't have enough cash to even make an offer. I should have mentioned that I'm in Upstate/Central NY. My limit is $3,000. I'm trying to find something locally, just so me & somebody more experienced than I can go out to look it over. But everything near me is way overpriced, or is a full resto job. 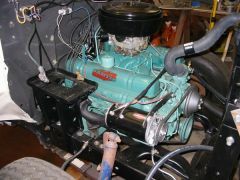 I emailed the administrator over at http://www.edsel.com, and he said it was a proposed engine manifold cover. The tube was an air intake. The Vac-U-Start used smaller-diameter metal tubes that could withstand vacuum pressure without collapsing. It is similar to the plastic covers we have on today's engines. I actually found it on eBay. It's an old picture. Other than that there was no description. I've done a little research, and my best guess now is something called a Vac-U-Start, which would automatically start your engine if it stalled. I guess you'd put your Edsel in to park or neutral. Unfortunately, it didn't really work, and never went into production. But supposedly, a few '57 Lincolns were built with them. But I'm still not sure that's what it is, because I've never seen any pictures of a Vac-U-Start. I'd rather spend half a day polishing chrome than having acres of plastic in my interior. She's a beauty. The 58's have such a cool dashboard. One of my favorite engines right there!